This post is a follow-up to my post about querying the top related item by group. In this post we'll go over ways to retrieve the top N related objects by group using the Peewee ORM. I've also presented the SQL and the underlying ideas behind the queries, so you can translate them to whatever ORM / query layer you are using. 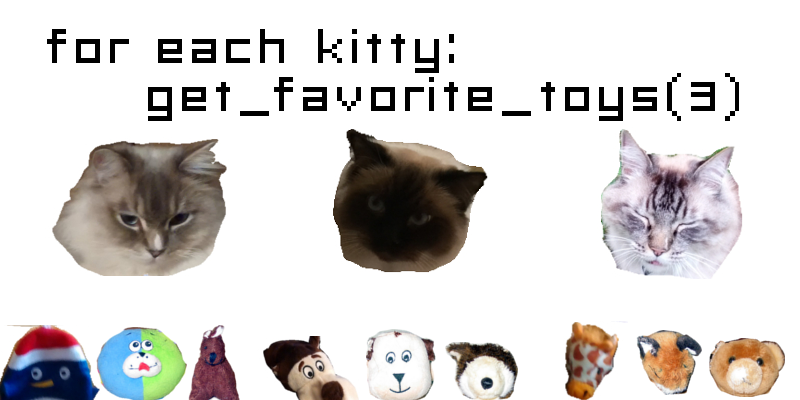 Display my followers and their 10 most recent tweets. In each of my inboxes, list the 5 most recent unread messages. List the sections of the news site and the three latest stories in each. List the five best sales in each department. This approach has the benefit of simplicity, and works fine for smaller applications or situations where the list of users is not very large. Since we have an index on the Post.timestamp and Post.user fields, retrieving the latest posts for a user is quite fast. As we'll see when we start comparing the execution times of various queries, it may surprise you that with SQLite the naive O(n) approach may actually be a very good choice! However, with a more sophisticated database like Postgresql, or a database that is accessed over a network, the O(n) approach is not likely to be the best choice. In the previous post we were focused only on retrieving the single most-recent Post by a given User. Because we only needed one Post, we could use the Max() aggregate and other tricks like NOT EXISTS. The more general most recent N query requires a different approach. Get all the posts where there are less than N posts with a higher timestamp. # looking at in the outer query. # Wrap the subquery and filter on the count. As you might imagine, this query is probably not very efficient since the subquery is correlated and must be calculated separately for each post in the outer query. Another way we can express similar logic is by doing a self-join on Post and using a combination of join predicates and the SQL HAVING clause to restrict the result set. This query is also fairly simple and will work on both Postgresql and SQLite. Despite the simplicity of the query, the self-join ends up being pretty expensive and gives the query a pretty bad run-time on both SQLite and Postgresql. # determine the number of newer posts for a given post. I'll omit the corresponding SQL for brevity and because the query did not really show much improvement over the previous examples. After giving up on trying to use COUNT(), I decided to try a different approach using subqueries and LIMIT. With this query, we'll create a subquery for each user which retrieves that user's posts ordered newest-to-oldest. A LIMIT 3 is applied to the subquery to ensure that a maximum of three posts are returned for each user. Then, in our outer query, we'll restrict the result set to those posts that correspond to a row in the correlated subquery. # posts represented by the inner query. 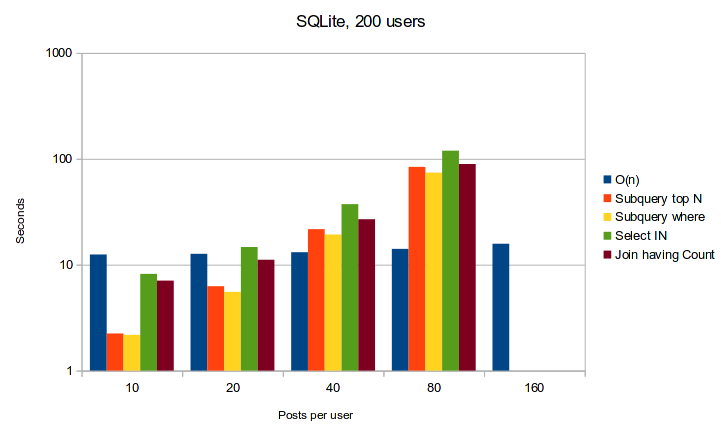 As with our previous attempts using COUNT(), these queries performed badly on both SQLite and Postgresql. The final queries we will look at use window functions to calculate aggregates over windows of rows. For our use-case, these windows will be the set of posts created by a given user. We will be calculating the ordered rank of these posts and filtering so that we only retrieve the three newest posts by user. 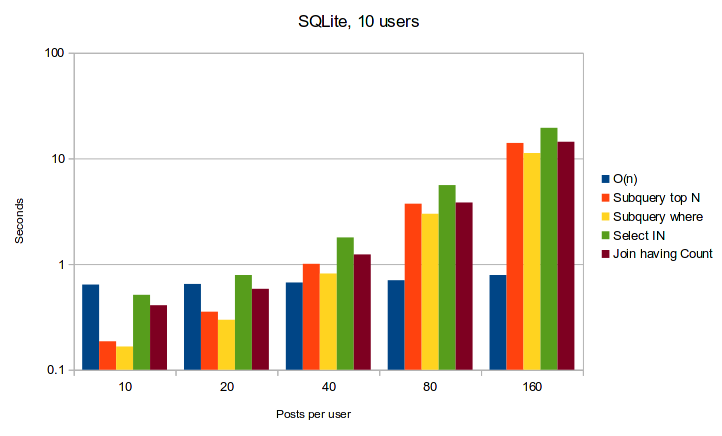 The good news is that these queries were by far the most performant! The downside is that at the time of writing, SQLite does not support window functions, so they only work if you're using Postgresql. Window functions are great, but there are some restrictions on how and where you can use them to filter result-sets, due to the order in which they're evaluated. To get them working I had to use some small workarounds. # Calculate the ranked posts per user as a separate "table". # only get posts that are ranked less-than or equal-to *N*. # and performing the filtering in the outer query. Almost all the logic for selecting and joining occurs in the subquery. The outer query is only responsible for filtering the ranked results. Both of these window queries had similar run-times, but the second query (the wrapped subquery) was faster overall. If you're using Postgresql 9.3 or newer, there's a cool feature called lateral joins that seems to have been designed exactly for this type of query. Lateral joins act like for each loops, where each joined query can be correlated with data from previously-joined queries. I stumbled on these late into writing the post so they aren't included in the performance section below, but I believe they are a great option if you're using Postgresql. # We'll reference `Post` twice, so keep an alias handy. # over the users whose posts we are trying to find. # joining in the post subquery's WHERE clause. # Finally, we'll wrap these up and SELECT from the result. It's definitely a bit unusual, but in my brief testing it seemed quite performant and looks like a viable solution to this type of problem. For more information, here are the Postgresql 9.3 release notes. As always, these results are not indicative of some absolute truth and you should always profile your code before and after attempting any optimizations. Your results may differ quite a bit from the results presented below, as they will be very dependent on the size and shape of your data, and the configuration and choice of database engine. That being said, the results from my testing were pretty clear. 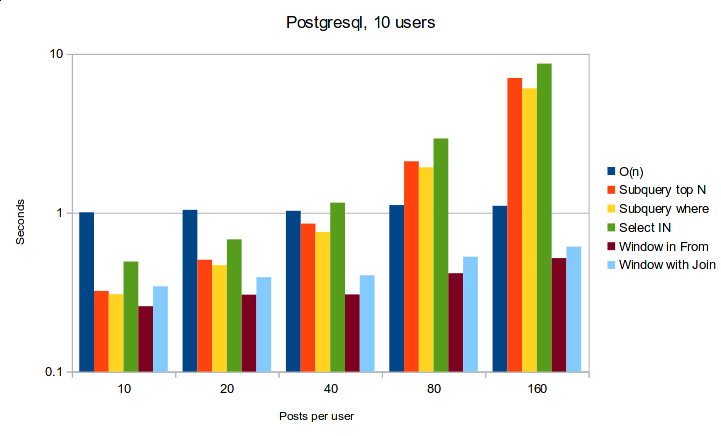 If you're using Postgresql, window functions are going to be a lot faster and more scalable than the alternatives presented in this post. If you're using SQLite, then the results are a bit disconcerting as the most reliable performance can be achieved using the naive O(n) queries approach. The caveat with SQLite is that I was using an in-memory SQLite database for the benchmarks, and an on-disk database may have very different performance. 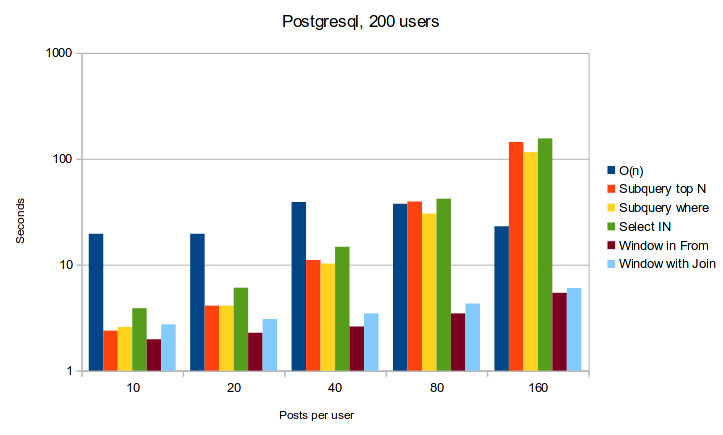 Below are some graphs showing the run-times of these queries with different ratios of users to posts. Thanks for taking the time to read this post, I hope you found it helpful. Please feel free to make a comment if you have any questions, comments, or suggestions. I'd really like to hear about other approaches for solving this type of problem with SQL, so please don't be shy!